The University has added another feather to its cap by winning a new grant for research. The grant is called M-BOSs, which the Director of Biotechnology Centre of FUNAAB, Dr. Olusegun Obadina, said was based on the project titled, “Up-Scaling Millet Grain Sourdough Technology and Extruded Snacks for Sustainable Livelihood in West Africa – Millet – Sourdough”. According to Dr. Obadina, the award is a follow-up to the successes of the previous grant called the African Brazil Agricultural Innovation Market Place; a body organised by EMBRAPA, a Brazilian Agricultural Research Corporation that has different centres, which deals in agriculture with specialisation in food commodities such as roots and crops, vegetables and animal husbandry, spread across various parts of the country. An initiative of EMBRAPA in Brazil and Forum for Agricultural Research in Africa (FARA), the Africa Brazil Agricultural Innovation Market Place, aims at addressing the common agricultural challenges between Africa as a continent and Brazil as a country, because it is believed that both nations have similar agricultural challenges, based on their climatic conditions and the need to come together and develop a platform that they could both operate, in order to reduce the challenges of food insecurity. Speaking on the first grant, which eventually earned them the second, Dr. Obadina disclosed that in 2013, when the Agricultural Innovation Market Place started, it offered a call for scientists or researchers from the African continent to collaborate with an identified researcher in EMBRAPA, Brazil and he applied in collaboration with a colleague at EMBRAPA Food Technology at Rio de Janeirio, Brazil and got the grant, which ran from 2013 to 2015. “The project, then, was on Nutritional Properties and Health Functionality of Whole Grain Millet Sourdough and in that project, what we tried to do was to use millet, which is a common cereal in Nigeria that is underutilised and nutritious, to produce bread from a technology known as sourdough. In this part of the world, Nigeria, to be specific, sourdough is new but not to the western world. It is a simple technology, where bread is being produced without the addition of yeast, as against the normal procedure, where yeast is responsible for the fermentation in making the dough. The same technology is used here but the only difference is that yeast, which is the raising agent, is not added. In this technique, natural microorganisms, is used to do the fermentation. After getting the flour and other ingredients, we allow it to ferment naturally and the result of our research shows that this leaves a sour taste for the dough and so, that is where the name, sourdough technology, comes from”. Dr. Obadina disclosed that the unique attribute of the project was the use of millet, an underutilised grain of which Nigeria is second largest producer, as against wheat, because of its high cost of importation, adding that it had been discovered that millet is more nutritious than wheat. He also pointed out that another good thing about the project was that since the increased awareness on gluten-free product, people had been avoiding gluten product because of a disease called celiac, which arises from too much of gluten in the blood system, stating that millet was the alternative. The University Don stated that the research work carried out was on the two major varieties of millet in Nigeria; pearl millet and finger millet and from the research, it was discovered that pearl millet sourdough was more acceptable to consumers, in terms of acceptability and nutritional value. The Director, Biotechnology Centre said that in 2016, EMBRAPA and FARA came together and put forward another call, known as MBOSs, which is all about building on the successes of the Africa Brazil Agricultural Innovation Market Place, “meaning that for you to participate in MBOSs, you must have undergone a project under market place, which must have been successful. So, it is the successes on that project in marketplace that now needs to be built on by up-scaling on the idea or project in the first project”. According to Dr. Obadina, the Millet Sourdough Project titled, “Up-scaling Millet Grain Sourdough Technology and Extruded Snacks For Sustainable Livelihood in West Africa” would be implemented in three West African countries namely; Nigeria, Ghana and Benin Republic, with technical backstopping from EMBRAPA, Rio de Janeirio. The implementing institutions are the Federal University of Agriculture, Abeokuta (FUNAAB) as the leading African partner; Food Research Institute (FRI), Ghana; University of Abormey Calavi, Benin Republic and EMBRAPA, Rio de Janeirio, Brazil. The project has a 30 months’ duration with a total funding of $663,589.70 and would be scaling-out the successes recorded in our Agricultural Innovative Marketplace-funded project titled; ‘Nutritional Properties and Health Functionality of WholegrainMillet Sourdoughs’. The Millet-Sourdough project is expected to increase the utilisation of indigenous millet varieties for bread and snacks-making in West Africa. The use of wholegrain millet sourdough technique would produce more nutritious, more flavour-intense and low glycemic-index bread. Dr. Obadina added that some challenges to be addressed by the project include overdependence on imported wheat for producing flour for baking industries in West Africa, adding that the health challenges posed with the consumption of bread and confectionery, made from 100 per cent wheat flour, had necessitated the probe into the use of composite flour with the inclusion of indigenous nutritious grains flour. “Millets are commonly grown in the selected countries, where they are processed into flour for making traditional thick-and-thin porridges, steam-cooked products like Couscous, alcoholic and non-alcoholic beverages. They have not been widely used in bread and extrusion-making because they lack the structure-forming protein, gluten, present only in wheat. However, the use of sourdough technique is known to improve the baking potential of non-wheat flours”. The Director, Biotechnology Centre noted that the innovative component of the project was the production of millet sourdough, using the pearl variety. The sourdough is to be used to produce bread and extruded snacks that would be used to improve the nutritional and health status of school children, saying extrusion technology was particularly important for obtaining processed foods that are stable to temperature variation and safe of microorganism. It is easy to store without refrigeration, therefore, low energy is required. The technique can be adopted by small and medium scale enterprises. Also, the versatility on the use of the blends of cereals, legumes and even dehydrated local fruits that are nutritionally combined can provide snacks, ready-to-prepare flours and ingredients for bakeries and this would reduce the dependence on wheat in the bakery industry. 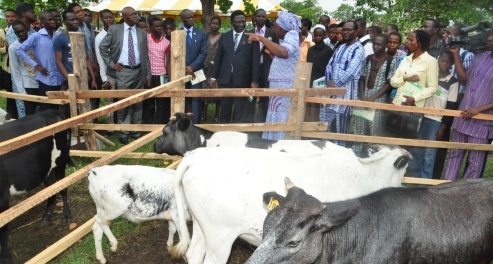 Speaking on the advantages to be derived from the project, Dr. Obadina stated that the project would cover the purchase of a pilot scale state-of-the-art extrusion machine and baking equipment, which would be domiciled at the Department of Food Science and Technology, College of Food Science and Human Ecology (COLFHEC), FUNAAB; Food Research Institute (FRI), Ghana; and University of Abormey Calavi, Benin Republic. In the University, the grant would offer full scholarship to four PhD and three M.Sc students, to be attached to the project from the Departments of Food Science and Technology; Nutrition and Dietetics; and Agricultural Extension and Rural Development. Other team members on the project include Dr. Oluseye Onabanjo, Department of Nutrition and Dietetics (COLFHEC); Dr. Petra Abdulsalam-Saghir, Department of Agricultural Extension and Rural Development (COLAMRUD); and Mr. Bernard Siwoku, Cassava Adding Value to Africa (C:AVA II), Nigeria and implemented with technical support from experts, who would serve as consultants to the project.